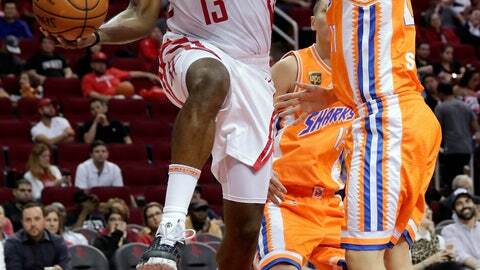 Houston’s Zhou Qi played only three minutes Tuesday night before the 7-foot-1 center from China sprained his left knee against the Shanghai Sharks. Qi, the Rockets‘ second-round pick in 2016 who played in 18 games last season, was playing in his first preseason game. He bent over to pick up a loose ball in the lane in the second quarter when Shanghai’s Luis Scola crashed into his left knee, bending it sideways. The 22-year-old Qi immediately grimaced in pain and grabbed for the knee. He was taken to the locker room in a wheelchair. Coach Mike D’Antoni said before the game Qi was expected to see plenty of playing time against Yao Ming’s former team. It was one of 13 preseason games this year where NBA teams host international clubs. The other international teams include the Beijing Ducks, Melbourne United, New Zealand Breakers, Sydney Kings and Perth Wildcats. In addition, the Mavericks and 76ers played two exhibition games against each other in China this preseason. James Harden had 37 points in 30 minutes, leading the Rockets to the victory. Harden was 13 of 18 from the field, including 9 of 14 from 3-point range. He also had nine assists. PJ Tucker had 22 points and six 3-pointers as the Rockets launched 66 3s, making 28. Jimmer Fredette led the way for the Sharks with 41 points on 16-of-40 shooting. He also had nine rebounds and three assists. Scola, a former Rocket, finished with 18 points on 8-of-13 shooting and 12 rebounds. SHARKS: Fredette played all 48 minutes. … Center Zhang Zhaoxu had 10 points and five rebounds. ROCKETS: Houston hit 17 3s in the first half and scored 73 points. … Harden had 17 points in the first quarter as the Rockets built a 38-20 lead. … Gary Clark had 16 points and James Ennis III and Gerald Green each scored 15. … Brandon Sampson had four points and missed all three 3-point attempts in his first game with the Rockets. UP NEXT: Houston (3-1) visits Memphis on Friday. Deonte Burton had 16 points for the Thunder, including the go-ahead 3-pointer in overtime. Paul George played only the first half and finished with a game-high 26 points on 8-of-13 shooting. Christian Wood had 19 points on 7-of-10 shooting and 15 rebounds for the Bucks. Tyler Zeller had 17 points, and Tim Frazier made a buzzer-beating 3-pointer from the top of the key to send the game into overtime. BUCKS: Rookie guard Donte DiVincenzo, who helped lead Villanova to the national championship last season, got the start for the Bucks. He missed his first four shots and finished with 12 points on 3-of-10 shooting. … Giannis Antetokounmpo, Eric Bledsoe, Brook Lopez, Khris Middleton and Ersan Ilyasova were given the night off to rest. THUNDER: Russell Westbrook did not play. … Hamidou Diallo added 19 points and Nerlens Noel had 10 rebounds. … Timothe Lewawu-Cabarrot had 10 points off the bench. UP NEXT: Oklahoma City (3-1) visits Golden State for the regular-season opener Tuesday. Milwaukee (2-1) visits Minnesota on Friday in preseason finale. Danilo Gallinari scored 16 points in 20 minutes to help the Clippers to the victory. The Clippers pulled away with a 10-2 run to start the fourth quarter and led the rest of the way. Trey Lyles had 15 points, 10 rebounds and five assists in 24 minutes for the Nuggets. Monte Morris added 14 points and six assists. CLIPPERS: With regular starters Tobias Harris and Marcin Gortat resting, 7-foot-3 center Boban Marjanovic and No. 11 pick Shai Gilgeous-Alexander were in the starting lineup. Marjanovic had 14 points, 12 rebounds and three blocks in 14 minutes. … Hours before the game, the Clippers announced they had waived undrafted rookie Desi Rodriguez. … Milos Teodosic went scoreless in his preseason debut. He was held out of the previous three games with a hamstring injury. NUGGETS: Coach Michael Malone played Denver’s regular starters for the entire first quarter and sat them the rest of the game. … Malik Beasley scored 12, and Will Barton and Juancho Hernangomez added 11 points each. … Denver shot 58.1 percent from the field in the first half and 25.5 percent in the second. … Nikola Jokic had two turnovers in 12 minutes and has 14 turnovers to just 13 assists in 78 preseason minutes. UP NEXT: The Clippers (4-0) host Maccabi Haifa on Thursday to wrap up their preseason. The Nuggets (3-1) conclude their preseason with a trip to Chicago on Friday. … Denver will visit the Clippers on Oct. 17 to open the regular season.